After years of hints and two concepts later, Volkswagen has taken the wraps off its new mid-size three-row SUV, the 2018 Atlas. The German automaker already offers a mid-size SUV, the Touareg, but it only has two rows of seats and was priced as a near-luxury vehicle. With the addition of a three-row SUV, Volkswagen is now set to compete in a rapidly growing segment. The Atlas will be sold in five trim levels to be named later. At 198.3 inches long and 77.9 inches wide, the Atlas becomes the largest vehicle in the Volkswagen lineup. For perspective, it's about 10 inches longer and 1.5 inches wider than the Touareg, which accounts for the added row of seating. The Atlas' styling has a lot in common with the CrossBlue concept and, frankly, a lot in common with the Touareg as well. 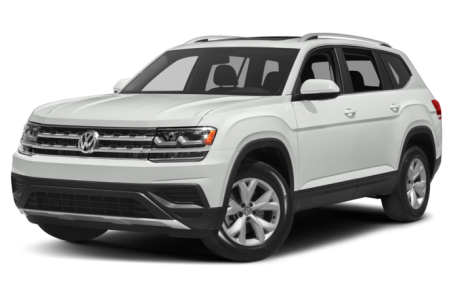 Volkswagen didn't take any risks with the Atlas' design; it is a clean, minimalist look that jibes well with the rest of its lineup. LED headlights and daytime running lights come standard. Volkswagen says the third row offers seating for two adults but, as with other members of this class. The second row has been designed to fold forward to allow third-row access even with a child-safety seat installed, a feature it shares with the Mazda CX-9. On the technology front, there are a few notable features. Volkswagen's version of the Audi Virtual Cockpit system, which it calls Digital Cockpit, will be available. This turns the instrument panel into a customizable digital screen that the driver can modify to show the information they want right behind the wheel. Both the CrossBlue and Cross Coupe GTE concepts had plug-in hybrid drivetrains, but the Atlas sticks with two gas engine options: a turbocharged 2.0-liter four-cylinder and an optional 3.6-liter V-6, which comes on VR6 models. There is one large caveat here, however: If you do want AWD, it will only be available with the V-6 engine. The smaller, four-cylinder base engine only comes with front-wheel drive. Atlases equipped with 4motion AWD will also feature Volkswagen's Driving Mode Selection feature, which allows the driver to choose among driving modes. There is also a dial that swaps between four off-road driving modes for a variety of surfaces. The Atlas will offer the requisite driving and safety technology found in the latest vehicles, including adaptive cruise control, forward collision warning with autonomous braking, blind spot monitor with rear cross-traffic alert, lane departure warning with lane keep assist and an automatic parking system, which works for both parallel and perpendicular spaces. Also available is an automatic post-collision braking system that Volkswagen says is a class-exclusive feature to the Atlas. 28 of 29 (96%) consumers said they would recommend this vehicle to a friend.